Complacency by food related businesses to take adequate steps to protect from pest related contamination has seen many receive heavy fines and penalties of up to $100,000. In order to protect public health and safety, the Government has shut down many noncompliant businesses. Consequently, your reputation can be damaged irreparably and you can be “named and shamed by the Government. The severity of noncompliance is further escalated as customers who fall ill from pest contaminated food can take legal action against you. A professional Pest Protection Program provides the protection you require to keep your business safe. PestAway is a nationally recognised leader in delivering quality HACCP approved pest control programs which assist commercial food industry clients to comply with their legal requirements and protect from the costly and devastating impact of harmful pest invasion. 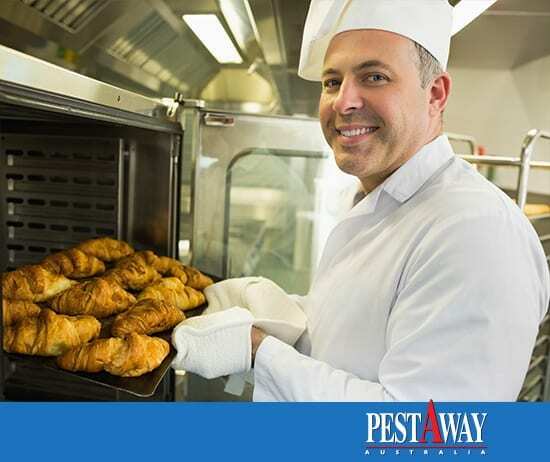 PestAway provides cost effective custom tailored solutions which are based on HACCP Australia’s strict guidelines and utilises an intelligent holistic approach. We are trained to implement successful programs specifically targeted to food related pests and work closely with you to ensure you are covered. Please follow the links to learn more about our integrated pest management programs and HACCP compliant online pest reports and the aepma pest management handbook for food service business operators . Commercial food clients require different pest management programs to protect their business. At PestAway, we have a team of specialty pest controllers and carefully match your requirements with the right technician to ensure you have the very best care. We provide custom tailored pest management programs to meet your budget no matter how big or small your business may be. At no time do we sacrifice the quality of our service but rather we work carefully with you to make sure you are protected. We provide our commercial clients with an online port in which they can access the details and results of their custom tailored pest management program. During auditing procedures, our commercial clients are able to access compliant pest management documentation.